There are already thousands of Dual core smartphone in the market and now iBall has launched yet another smartphone the Andi 5 M8 with 1.3GHz dual core CPU. The Andi5 M 8 comes with a 5inch capacitive touch screen display having resolution of 854 x 480 pixels. The handset gains the strength from 1.3GHz dual core cortex A7 processor and runs on Android v4.2.2 Jellybean OS. The specifications of the phone are quite generic. The Andi5 M8 features 3G,WiFi, Bluetooth, GPS, WiFi direct, HSPA+ and has G-sensor, light & proximity sensor. The handset is boosted with 512MB of RAM and has 4GB of internal storage , which can be further expandable up to 32GB via micro SD card. The Andi 5M 8 packs with 8MP rear camera with LED flash and a VGA front camera. 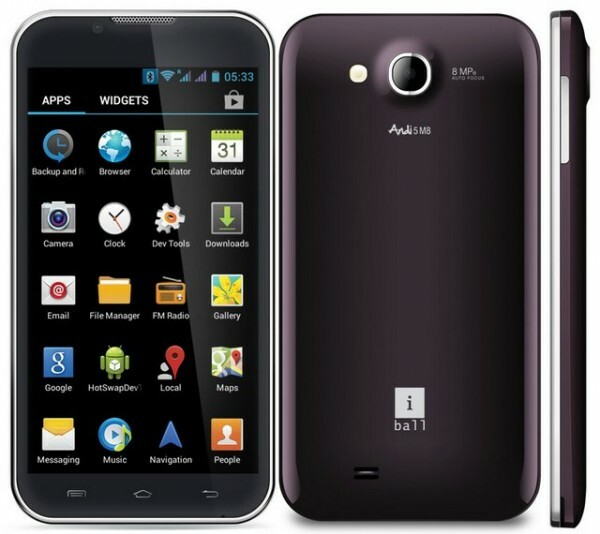 It is a Dual SIM smartphone and it will compete with recently launched Micromax Canvas Juice A77 that has 1GB of RAM. The look of Andi-5M8 is similar of Canvas A100, actually its decent and eye pleasing. The iBall Andi 5 M8 is priced at RS.8999 and it would go on sale by next week.